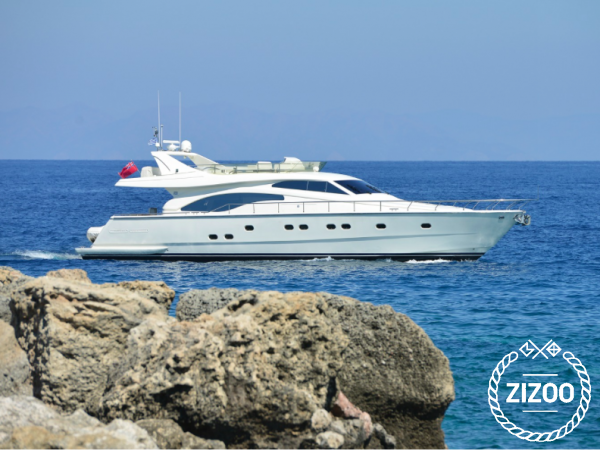 Are you looking for the perfect party boat to hire in Rhodes? Look no further. Charter this stunning Ferretti 68 superyacht in Rhodes for a trip of a lifetime. Available for a day or multiple day charter, this fully crewed luxury yacht will take you to some of the best destinations in and around the Greek island of Rhodes. Accommodating up to 8 guests for overnight stays, this deluxe yacht offers plenty of space for entertaining both inside and out on deck. Let the crew prepare the BBQ and enjoy meals made from the finest ingredients accompanied by fine Greek wines. You and your friends will love to use the onboard water toys including a jet-ski and fishing equipment. Want to find out what else you can do when you charter this Ferretti 68? Check out our blog on luxury yacht charters in the Mediterranean. It was the perfect trip! The crew was great and knew a lot about the island.